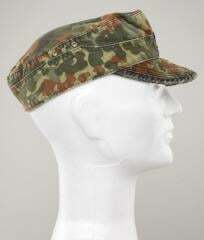 A sharp looking field cap, German Bundeswehr issue. The shape is similar to the WW2 Feldmütze. Army field caps are perfect for summer cottage use or as general bushcrafting and camping headgear. These are low-key, durable and functional. 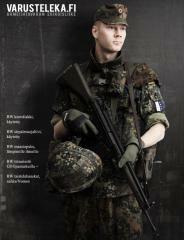 Used military surplus. Washed and most likely a bit faded. Due to shrinkage it might be a good idea to pick one size larger than you usually wear. Wonderful hat. Great condition, stylish and comfortable. Great cap, looks nice and the washed out colours really suit the look. However I have size 58 head and I've ordered both a size 58 and 59 and both are -extremely- tight in the fit, the 58 one was way too tight and the 59 is still squeezing my head in, might wanna shave your head at this point, so start high on the size is my suggestion. Update: After some steaming and tugging the size 59 one finally just slips on without squeezing my cranium. Hoowee. While the hat that I received was in good enough condition (only minor wear and fading, dating from 1995), the size feels that it wears smaller than indicated (56cm hat for my 56 cm head). Of course, this could be a result of the fact that my hair is a bit longer than what would probably be expected of the soldiers this was originally intended for (not to mention the fact that my hair is quite thick). Despite that, it is a fun hat to wear and I get a lot of kicks out of confusing my friends and family whilst wearing it. Good hat but the fit is very tight, would be a good idea to get 1-3 sizes bigger than usual. Looks okay, but bloody hell they are tight! If you're going to buy one, go two or three sizes up! I'm a 59 and need a 61, otherwise it feels like it's just sitting on top of your head, and the slightest breeze will blow it off!! Both mine came in great shape, but obviously not brand new. I disagree with the sizing discrepancies others have stated. I wear a 7-1/4 hat or 59 cm 99% of the time. I ordered a 59 and 60 cm and both fit well, the 60 is just a touch loose, but very wearable. The 59 is the one I chose for use. This is a short cap. Most Americans, myself included will probably find the fit a bit odd, but I assure everyone they are sized properly. It's $5, buy a few and pick the one you like. To me it's more of an oversized side cap with a small soft bill rather than a field cap. The fit feels a bit awkward at first due to the shallowness of the cap (like a sidecap) but you get used to it. Although, I am American and have gotten used to our large, deep fitting patrol caps with wide shielding brims so that might be responsible for my opinion. 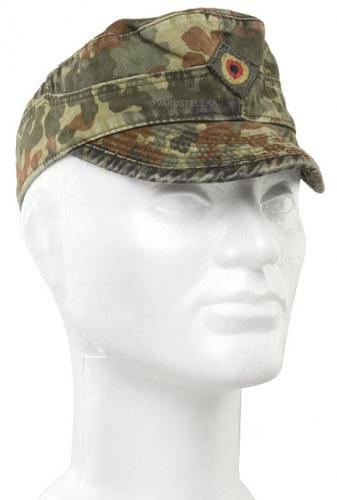 Still, it's a nifty cap that looks sharp to wear especially along with my flecktarn anorak and definitely a neat bit of german milsurp for the price. Can't rate it 5 stars due to the sizing issues. Read the description (order up a size), and the reviews ( tight, tight, tight, order up 1-3 sizes, or 2-3 sizes). Well, I ordered a 59 to hopefully fit my 57 head. They sent me a BRAND NEW, 2011, size 59, never worn, never washed, beautiful hat, brilliant camo colors, and TWO SIZES TOO BIG! I can't recommend this to a friend because I wouldn't know how to tell him(or her) what size to order to get a hat that fits. If I order a 57 now, I'm sure it'll be too small. Had I expected a NEW HAT I would have ordered a size 57! Can't win with shipping at $10. a whack. So I followed the guide on how to pick the right size, my head is 56 so I ordered a 57. When it arrived, I expected that the cap would fit. Unfortunately its probably 3-2 sizes smaller than I expected. Though the quality is quite decent, im a bit upset that the cap isnt just a size smaller from the original size.